Flicking through August's Good Housekeeping, scanning for a spontaneous, quick supper, I came across a promotion for a brand of cooking spray, and a Lebanese recipe for Chicken Fattee, by James Ramsden. Grill the chicken for about 3-4 minutes each side. Slice into bite-sized pieces. Pan-fry the onion for a few minutes, then add in the garlic until softened. Add the harissa spice mix, chilli flakes, and cinnamon and fry for less than a minute then add in the tomato passata, red wine vinegar, and sugar. Simmer for about 15 minutes until thickened. Dice up the salad - red onion, pepper and cucumber. Grill the tortillas, with a spray of olive oil, for 1 minute each side until crisp, then quarter. 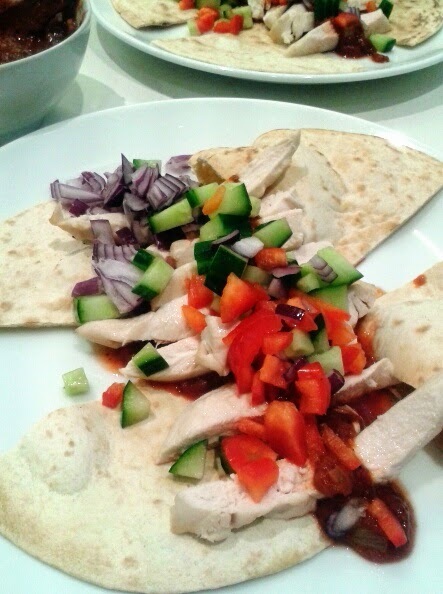 Serve the tortilla, topped with the tomato chilli sauce, then the sliced chicken and salad.